Chiang Mai is one of the most interesting and charming cities in Asia and to experience it on the road will only broaden and enhance the experience. But their are some recommendations which you should invariably follow in order to ensure a safe and pleasant ride. I recommend starting it and making sure it runs smoothly. Also photograph all scratches and visible defects. Also make sure they are all duly noted by the shop keeper. 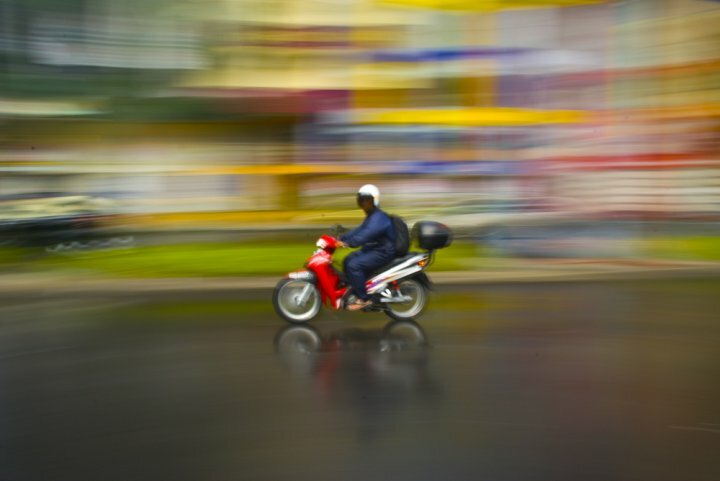 Thailand is plagued by a huge number of road accidents and Chiang Mai is no exception. The motorbike shop will usually give you a little flimsy helmet, but a few more baht will get you a full face helmet. Enough said. Driving in Thailand is at times very unpredictable. Thais don’t signal their intentions as frequently as people from Europe, North America, Australia or Japan do. Driving can therefore be challenging. Car drivers will also sometime consider motor cyclists and cyclists as inferior on the road simply because they have much smaller vehicles, and won’t hesitate to cut you off. The region surrounding Chiang Mai is beautiful. There are several interesting and charming spots just 30 or 40 minutes outside the city such as the San Kampheang hot spring. Or simply riding around the country side and eating with local farmers can be quite fun. Chiang Mai is a very safe city but motorbike theft is relatively high. Try to bring your motorbike within the gates of your guesthouse or hotel and lock it. Also note that motorbikes can easily disappear from monitored parking lots at shopping malls. Let’s face it : alcohol in Thailand is very cheap, and it’s extremely easy to loose awareness. Because of this, the roads in Chiang Mai at night are full of drivers who have had a little too much to drink, thus, making the road generally much more dangerous than during the daytime. An important recommendation would be to simply go out by foot ; Chiang Mai is a fairly small city and several drinking spots within walking distance of all guesthouse areas. You will get cut off; this is just a fact. In fact, you will cut off 2 or 3 times per hour of riding. This is how drivers are in Thailand. Let it go. This is an easy target. Although rare, this kind of theft does happen.